2850-11/39 - Oregon Coast cursive script embroidered patch. 4.375" wide x 2.25" tall - Patches sew or iron-on & are carded for a display rack. © Holm Patches Made in USA. 2850-21M/01 - Oregon Coast cursive script embroidered patch. 4.375" wide x 2.25" tall - Patches sew or iron-on & are carded for a display rack. © Holm Patches Made in USA. 2855 - OREGON medium flag shield embroidered patch. 2.5" wide x 2.75" tall - Patches sew or iron-on & are carded for a retail display for stores. OR-05 - OREGON rainbow cloud - 2" x 3 15/16" - Assorted border colors: Royal Blue, Light Blue, & White. 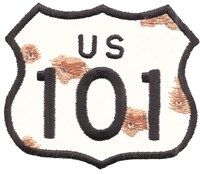 Patches are carded for a retail rack display. Made in USA. An iron-on backing can be added for +$.10.